"One tiny jab and you'll know nothing more about it until it's all over"
The Doctor interrupts the power supply allowing Polly to be freed by servant girl Ara who hides her in the temple of Ando. Zaroff explains his plan to raise Atlantis to the Doctor which the Doctor realises will destroy Earth. Zaroff has realised this too but is quite mad so doesn't care. Ben & Jamie escape from the mines with a pair of ship-wrecked sailors who were captured, Sean & Jacko. They emerge from a tunnel into the Temple of Ando finding Polly and Ara who brings them food. 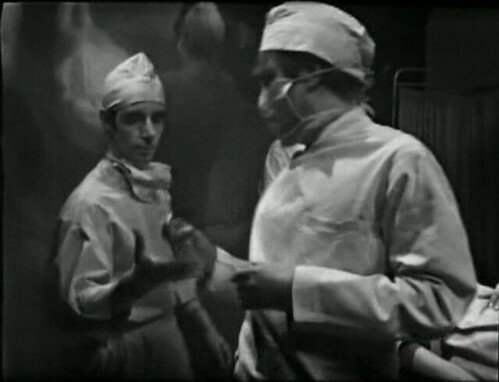 The Doctor escapes from the lab and meets Ramo, a priest, who is worried about Zaroff's scheme. They go to see King Thous, who hands them over to Zaroff as prisoners. which probably doesn't do it justice ...... especially now that we can see it! Underwater Menace 2 was returned to the BBC from TV engineer Tony Burnett via the Restoration Team's Ralph Montague - for the full story look at 084 Galaxy 4 Part 3: Airlock (again!) . As yet the episode hasn't been released on DVD or via iTunes. Unfortunately for the BBC it escaped onto the Tube of You a little while back so we now have a copy we can watch. The copy of Underwater Menace 2 that was found is missing precisely the sections that we had previously so we can say with absolute certainty that it's a print returned from the ABC in Australia on the 4th June 1975. This was a huge batch of returned episodes but when you go through Wiped you'll notice that every individual episode found in the UK could possibly be found in this batch. Also of note is that the collector who had this lived in Southampton: David Stead bought the copy of Wheel in Space 3 he had from a "Mr Smith of Pinedene films" in Southampton so I'm wondering if there's a common source for these prints. The version that escaped on YouTube is unrestored, returning us to the days of crackly looking prints on VHS/UK Gold, but with odd moments where the quality jumps massively as it cuts to a cut section restored from the censor clips on Lost in Time. The start of this episode (and some of the end of the previous one) survives courtesy of the Australian censors, and I can see why they cut it. It's genuinely one of the scariest things seen in Doctor Who with a bound and defenceless Polly about to undergo "The Operation" and with masked doctors approaching her with syringes. That would have scared the living daylights out of me if I'd have seen it at the time. It also proves that you don't get the whole story from the audio! The next episode of this story does survive but there's nothing in it to compare to this! Even watching it now the scenes with Polly strapped to the table really chill me, not nice at all. It also proves that you don't get the whole story from the audio! Not now, Damon, can't you see I am talking with my friend here. it sounds from the soundtrack as if he's saying the Doctor is his friend: not so, as he says it he's looking at his (offscreen sadly) pet octopus! Damon appears a lot more in this episode than in the existing episode 3 which is good because I'm a big fan of Colin Jeavons from his appearances in House of Cards. We also get a much more complete view of Atlantis with the lab, operating theatre and mineworks in addition to the Temple of Amdo and caves also seen in episode 3. In many ways watching this episode puts episode 3 in a much better light as you can see more of the broader picture that it fits into. I don't thing Underwater Menace is going to be winning any "best of season 4" polls any time soon because it is, after all, up against some pretty tough opposition in Tenth Planet, Power of the Daleks and Evil of the Daleks, but the return of episode 2 should help lift the overall opinion of the story which for many people has only been experienced by episode 3 which is probably the worst of the 3 episodes. What was it about the Troughton episodes retained in the archives? In 3 cases - Underwater Menace 3, Enemy of the World 3 and Space Pirates 2 - they're all pretty bad examples of the story. OK I'm not sure Space Pirates gets much better but in the other two cases the rest of the story is much better than what we could see. The lead guest star in this serial is Joseph Furst, playing Zaroff. An Austrian emigree he appears in the Bond film Diamonds are forever and later emigrated to Australia. Tom Watson, High Priest Ramo, had a long television career but I note he's got one of my favourite films Fahrenheit 451 on his CV. 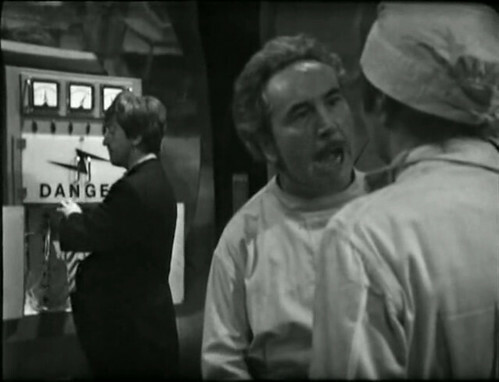 Playing Damon's Assistant, seen unmasked here, is a sixties Doctor Who regular: Gerald Taylor. He first appears in the sixth episode of Doctor, The Daleks 2: The Survivors as a Dalek, a role he repeats in Dalek Invasion of Earth, The Chase, Mission to the Unknown, Dalek Masterplan, Power of the Daleks & Evil of the Daleks. He was in The Web Planet as a Zarbi and The War Machines as a War Machine and the Voice of Wotan. This is his first on screen appearance as a human but he can be seen again as The Baker's Man in The Dæmons episode 2 and then heavily made up as Vega Nexos in Monster of Peladon episode 1. Graham Ashley, the Overseer, had been a regular as PC/DC/DS Tommy Hughes in Dixon of Dock Green and would later be a Grange Hill regular as Mr Garfield, then a Prison Officer, Mr Appleton, in Porridge and Gold 5 in Star Wars. See Smugglers part 3 for more on Director Julia Smith directing her second and final Doctor Who. She's the second woman director to work on the program after Paddy Russell who directed The Massacre the previous year. This story is the first and only Doctor Who for experienced script writer Geoffrey Orme. Orme was born 1904 which I think makes him the oldest writer credited on the show. William Hartnell was born after him in 1908 so up till this point he's the oldest person credited on the show fullstop. However I have found a performer in a later story born in the 19th century! 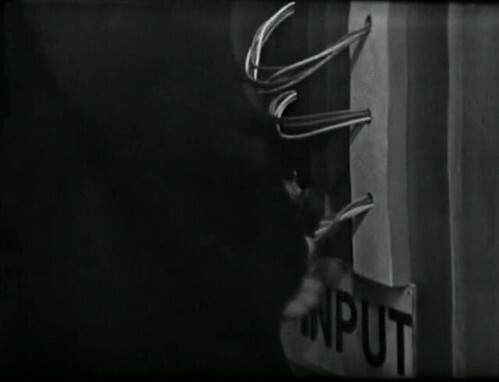 Underwater Menace 2 is the earliest surviving Troughton episode. This is the first time that record has changed since Ian Levine visited the BBC Film & Video Library in 1978. It's also the earliest episode with Jamie in it. With the next episode, Underwater Menace 3, we now have the earliest surviving consecutive pair of Troughton episode, beating Tomb of the Cybermen 1 & 2. Underwater Menace 2 now marks the end of the current longest run of missing episodes - Tenth Planet 4, Power of the Daleks 1-6, Highlanders 1-4, Underwater Menace 1 - 1+6+4+1 = 12. The next longest missing episodes run now is the 8 episodes from Fury from the Deep 1 - Wheel in Space 2 followed by a pair of 7s: all of Marco Polo and Galaxy 4 episode 4 to Dalek Masterplan 1. Underwater Menace is only the third episode of Season 4 to be returned, easily the worst of any season with missing episodes. Despite this return Season 4 is still the worst represented in the archive with just 10 of it's 43 episodes present. Sadly the possibility of returns isn't great: of the prints sold abroad just one, a copy of the Smugglers sold to Sierra Leone, has a question mark hanging over it's fate. However, as we've seen, returns from collectors can seemingly come from anywhere as many film prints returned to the BBC and seemingly destroyed have later turned up in private hands. ..... and in the intervening time it's been rather overshadowed by more high profile returns as we shall see from tomorrow. Happy 30th Birthday to The Five Doctors!